This story is no longer being updated. Please go here for the latest storm coverage. Snow has begun falling more heavily in the D.C. area as the region braces for what could be a historic, paralyzing blizzard. Authorities are warning this could be a life-threatening storm, with 2 to 3 feet of snow possible before it's all over. Snow is expected to fall continuously for 36 hours straight, with wind gusts up to 50 mph, creating treacherous roads and possibly leading to power outages. Road conditions were beginning to deteriorate by mid-afternoon Friday, several hours after News4 viewers in Manassas and Gainesville, Virginia, reported seeing the first flakes. By 1 p.m., light flurries began falling in Northwest Washington. Snow is now falling more steadily around the area, with a band of heavier snow moving through the Manassas area. By 4 p.m, it was heading for Alexandria, Arlington and the District -- and things are only expected to intensify from there, Storm Team4 said. By 4 p.m., the area was getting about 1/4 inch to 1/2 inch per hour, which is considered light to moderate snow. But later Friday night, we'll be getting 1 to 2 inches per hour. An inch of powdery snow had fallen by 3 p.m., with 2 inches by 4:15 p.m. Four inches are expected by 7 p.m., with 12 to 18 inches by sunrise Saturday. Storm Team4 said projected snowfall totals could make this the highest snowfall in D.C. history. Some parts of D.C., Maryland and Virginia could even get as much as 3 feet of snow, which would exceed the deadly 1922 Knickerbocker blizzard, during which 28 inches fell. Officials warned residents to be home by 3 p.m. Friday and prepared with 72 hours of supplies -- and to stay indoors and off the roads. The snow may not relent until Sunday morning and conditions will be hazardous, so you should already be wherever you're planning to sleep. 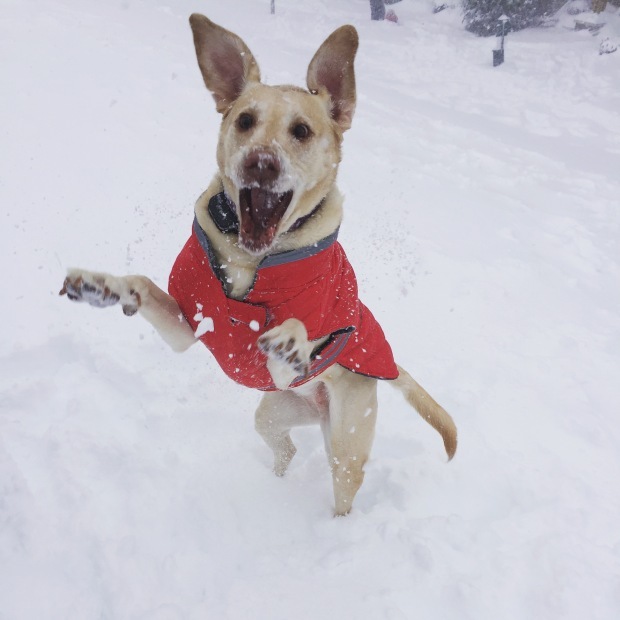 "By 3 o'clock today, you need to be where you're going to be throughout this storm," said Christopher Geldart, director of D.C.'s Homeland Security and Emergency Management Agency (HSEMA) Friday morning. Storm Team4 Meteorologist Doug Kammerer has the forecast for Jan. 22, 2016. Regional leaders have declared states of emergency. 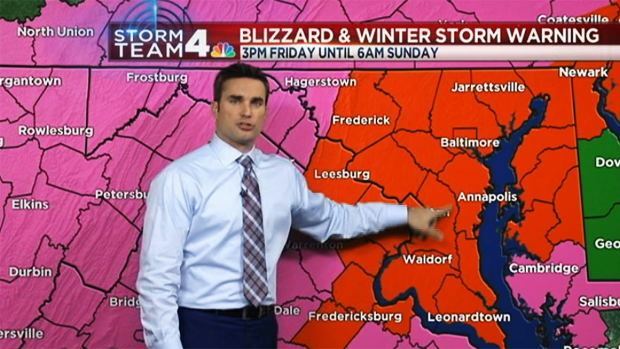 A blizzard warning for the D.C. area is now in effect, although Storm Team 4 blizzard conditions won't really begin until overnight, when winds bein gusting from 30 to 50 mph in the D.C. area. Anne Arundel, Calvert and St. Mary's counties, where a high wind warning is in effect, could be slammed by gusts of 65 mph. The blizzard warning won't expire for our area until Sunday at 6 a.m. The heavy snow and winds may tear down power lines and force road closures. Officials warned D.C. residents who use Pepco that they could face outages that last for days. Residents around the region have shared images of bare grocery store shelves and gas stations that have run out of fuel during a mad dash to prepare before the storm. The National Guard is deploying 100 personnel in 30 Humvees to transport essential employees throughout the city. D.C.'s emergency command center went live at 6 am. Friday and will stay live through the aftermath of the storm, likely early next week. Even after the snow stops falling, it will likely take awhile for the region to dig out. Metro announced that its entire system will close for the entire weekend, with Metrorail service ending at 11 p.m. Friday. Metrobus service shut down at 5 p.m. Friday, and MetroAccess will end at 6 p.m. All Metro services will remain shut down through Sunday night. County bus services are also closed or are preparing to close. Arlington County's ART bus ended service at 1:30 p.m. Friday and will stay closed through the weekend.& In Prince George's County, TheBus service has been suspended. Montgomery County's Ride On bus service will stop running at 7 p.m. Friday and will not run Saturday or Sunday. If we get 24 inches of snow, this storm would be the second-biggest snowstorm of all time, coming in only after 1922's devastating Knickerbocker Blizzard. During that storm, heavy snow caused the roof of the Knickerbocker Theatre to collapse in Adams Morgan, killing 98 people and seriously injuring 133.